I’ve been so excited to share this Maple Cranberry Apple Pie recipe I have been working on for Thanksgiving. It has a deep dish whole-grain crust. It is sweetened with maple syrup and has a crunchy nut crumb topping. I remember the very first time I made a pie by myself. It was for Thanksgiving and I was in my late teens. I followed a recipe for a crumb top apple pie from one of my mom’s old tattered and well loved copy of the Better Homes and Garden New Cookbook. It was one of the few really good cookbooks she left behind when my parents separated, and thank goodness, because you now know Dad and I weren’t exactly killing it in the kitchen yet. I remember following the recipe to a T.
Over the years, my Mom had shown me how to flute the edges, but I was pretty nervous about cutting the fat into the pastry. Looking back, it surely took me all day to do it. But it came out perfectly. Golden brown sweet sugar crumb topping, juicy filling, perfectly browned crust. I was so proud. Then that night at Thanksgiving dinner, I ate way too much. Like exploding pant buttons, and I have to go lie my whale-like body down on the couch for a few hours and concentrate on breathing ate too much. I didn’t eat any pie. Thankfully, there was one piece left and I blissfully had it for breakfast. It was perfection. It was sweet and juicy and crunchy crumbly flaky. All those things that a pie should be. To this day I actually still prefer my slice of Thanksgiving pie for breakfast. I love the sweetness with my morning coffee. I love actually having an appetite for it too the morning after Thanksgiving. I may even prefer it to all the other left-overs of Thanksgiving. Is that blasphemous to say? I also think that part of why it was so good to me that year was that I had taken the time to do the whole thing by myself, from scratch. I had that satisfaction of knowing I had the power within me to make something so iconic, and comforting. I also felt so proud that the other folks who’d eaten with us the night before had devoured the rest of the pie. That made me feel kinda awesome. Sharing that with them. At the risk of getting a little sappy here, I have to say something before I get to the cooks notes. 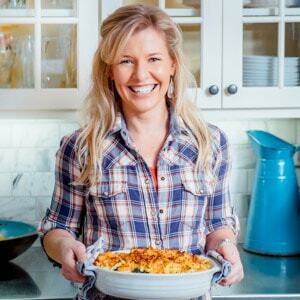 I think the reason so many of us love Thanksgiving so much, and why so many people go beyond the comfort of their tried and true recipes, and easy slow cooker make-it-work-people dinners, and make something a little special is for that feeling, of working really hard on something, sharing it with the people we love, and feeling proud of it. So this month, in honor of that collective enthusiasm for cooking from scratch and sharing it with our loved ones, you’ll be seeing another pie coming your way. I will also be sharing a killer new Thanksgiving stuffing recipe that is 100% gluten-free. And 100% delicious. I am perfecting it as we speak. I will also be having a guest blogger (or two?) Be sure to check out the Thanksgiving collection of recipes already on the site. And don’t miss this Ultimate Guide to Gluten-Free Pie by Fearless Dining for some awesome ideas. Please drop me an email letting me know if you’re looking for something in particular that you can’t find. I had to test this Dutch apple pie a few times to get it just right. Partly, I wanted to balance the sweetness of the maple and the cranberry. And I needed to get just the right amount of juiciness in the filling, while making it easy to serve. I ended up using both flour and cornstarch in the filling for the right amount of thickness. Make sure that you see the filling bubble before pulling it from the oven. I really loved the crunch of the almonds, which is surprising since pecans are a favorite around here. Use whatever nut you like though. This dough is really easy to work with. For more in-depth information about how to make the crust check out this post here about pie crust. I call for two types of apples. The Macs will break down and become juicy. The firmer apples will hold their texture a bit more. You can read more about my recommendations for which apples to use for what type of cooking in this post from 2011. I think the flavor of two varieties (or more) makes the flavor of the filling more complex. Do you remember the first time you made a pie? Do you feel more inspired to cook at Thanksgiving than other times of the year? Do you love apple pie for breakfast. 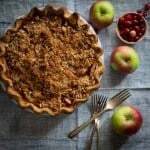 Here’s a Maple Cranberry Apple Pie recipe for Thanksgiving with a deep dish whole grain crust and a sweet crumble topping. Make crust: Pulse whole-wheat pastry flour, all-purpose flour, maple sugar and salt in food processor. Add butter, and process until the butter is cut in and the mixture resembles coarse meal. Open lid, drizzle on oil and pulse to combine. Open lid and drizzle on 3 tablespoons ice water. Process until the mixture just comes together. If the mixture seems dry or does not come together as a ball, try squeezing a handful of the crumbs together. If it still won’t come together, add up to 2 more tablespoons water. Form dough into a disk, wrap in plastic and refrigerate until firm and chilled, at least 1 hour. Arrange oven rack in the lower third of the oven. Preheat oven to 375ºF. Roll dough out to a circle, about 14-inches across. Transfer to a 9-inch deep-dish pie plate and crimp edges. Chill crust while you prepare filling. Make Filling: Toss Macintosh apples, firm apples, cranberries, maple syrup, all-purpose flour, cornstarch, cinnamon and salt in a large bowl. Make Topping: Stir whole-wheat flour, oats, sugar, cinnamon and salt in a medium bowl. Drizzle butter over the oat mixture, tossing with a fork. Sit until the crumbs are evenly moist. Add almonds and stir to completely combine. 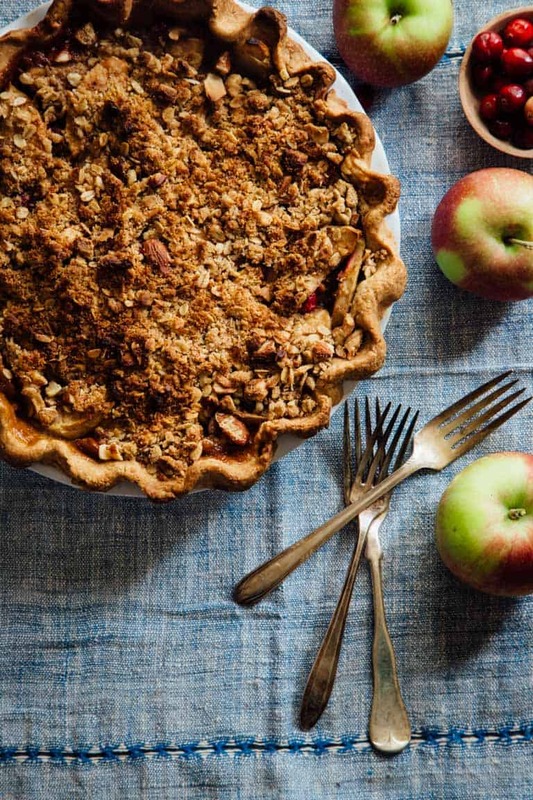 Fill crust with the apple mixture. Top with the almond crumb mixture and transfer the pie to the bottom rack of the oven. Bake until starting to brown, about 30 minutes. Reduce oven temperature to 325 degrees and continue baking until the filling bubbles and the crust is golden brown, about 1 hour 20 minutes to 1 hour 30 minutes. So funny Shashi. When I went to Blog and Bake at King Arthur last year, we did a whole session on pie. I was so freaked out to make the full on fat/sugar version for once in so long. They sure were delicious though! 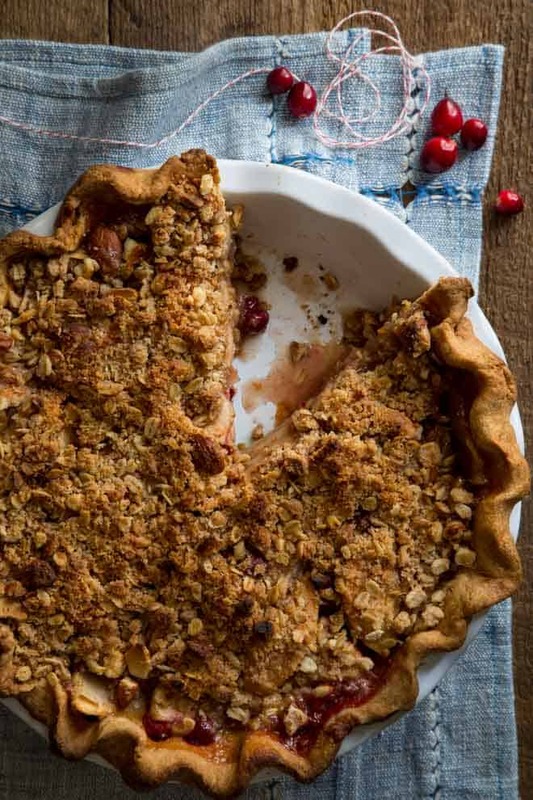 Love the combination of apples and cranberries – and that crumbly topping looks so good! Thank you Jeanette. Glad you think it is a winning combo too. I agree Liz. I always have them in the fridge during this part of the year. That reminds me, I should throw some in the freezer too! Thanks for pinning. I’m seriously jonesing for a slice of this lovely pie. Love these photos! Aw that is such a huge compliment coming from you. Thank you my dear! This looks AMAZING!!!! I need to make this even though I am not a very good baker! I will try though! You can do it Jessica! I would be honored. Just read the post I linked to about the crust tips. (Chai Cream Pie), there is some good pointers on how to make the crust work without it slumping. Beautiful pie! 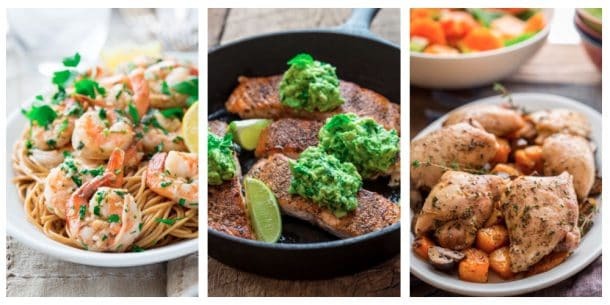 Cooking from scratch just brings so much love and FLAVOR to food! That it does Rebecca. Thanks so much for coming by today. Such a gorgeous pie! I agree with you, having pie for breakfast the next day is the best. I love waking up knowing there’s a slice of pie waiting for me in the kitchen! I have to say while working on this recipe, we had it for breakfast more than a couple of days. Ha ha, yes it is a veggie. My daughters will be thrilled to know that’s okay! This looks like a terrific pie! I love cranberries + apples and the crumb top makes it even better. The crumb top is a point of contention for the double crusted purists, but the added sweetness helps balance out the tart zing from the cranberries. 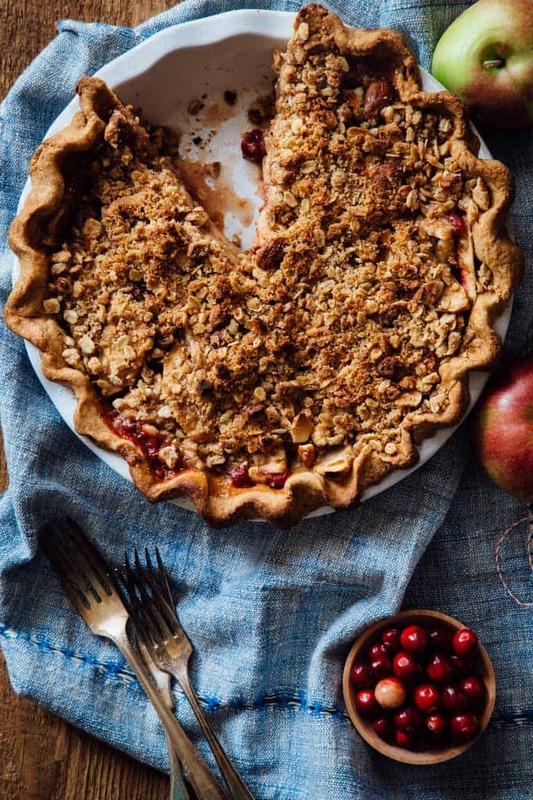 I love the idea of a whole wheat pie crust…and also, I’m super impressed/envious of how beautiful the fluting on your pie is! I can never seem to get it to turn out very intact. This looks seriously delicious! Literally pinning this to make for Christmas- I love apple crumble and in pie form- even better! What an honor Arman> Thank you so much and for pinning. Thanksgiving really is the best holiday. This pie is absolutely stunning, and I love the filling combo. Thank you so much Jennie. I love the combo of cranberries and apples. This indeed makes a great holiday dessert. Love particularly that streusel. Thank you Angie. I love them together too. totally obsessed with cranberries! love this recipe! yum! These looks delicious I love it because apple is my favorite fruit. Thank you for sharing this recipe I will try this at home soon and maybe include in my menu. It’s hard to believe we’re almost at the holidays again! This year is flying by! This is the perfect dessert for Thanksgiving! Would love to make a gluten free version for my family! I started cooking in my teens from my moms BH&G cookbook, too! Except I made lemon meringue pie. Now this apple crumb pie would be my preference!